Story: When the crew of an underwater mining base in 2119 Scotland discover and bring an alien space pod inside, disaster strikes, and silent ghosts begin to stalk the corridors. What is the meaning of the strange writing on the inside of the craft? Why do the ghosts only come out during the base's artificial "night"? And what could have happened to the Scottish town in the 1980's before it was flooded and submerged under the lake? 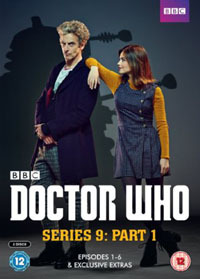 Audio commentary on both episodes by Sophie Stone (Cass), writer Toby Whithouse, and producer Derek Ritchie. executive producer Steven Moffat, and production designer Michael Pickwoad. "Sublime Online" featurette segment (approx. 5 min.) with Moffat, Capaldi, Stone, Taylor, Zaqi Ismail (Lunn), and Jenna Coleman (Clara Oswald). Doctor Who made one of its most impressive moves in recent years when it went straight from one dramatic two-parter into yet another substantial two-parter here. 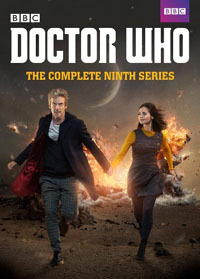 This story has the time to develop its characters and its mystery in ways that satisfy, while utilizing the base-under-siege formulas and giving Peter Capaldi's Doctor a fairly good outing. The opening scenes are okay, but not great. Perhaps a bit too much happens too fast in the hook, with there being too many characters on hand to appreciate. The stage is also set for a classic police box materialization, which is disappointingly left off screen for, I don't know, budgetary reasons? I must say that I don't like Clara's dialogue here either, as it tries to say that our protagonists' excitement should be geared towards "monsters" and danger, which is where the audience's interest may lie if the media is successful in dumbing them down to that level. I should rather think that the characters in the show were more interested in generally exploring the unknown, perhaps meeting exotic life forms without giving them negative labels like "monsters", and in pursuing safe fun, adventures, parties, and the like. It's like the show took one step too far outside of reality and into a parody of its darker aspects. However, the first episode of this story comes up trumps with a lot of really good sequences that nicely build and work the plot. The Doctor's investigations prove quite interesting, his problem-solving skills get a good work-out, and there are some nice triumphant twists like the sequence of catching the ghosts in the Faraday cage. I can also say that I do like the guest characters fairly well in this one. Most of them get enough time to differentiate themselves from each other, although it does take both episodes together to really get the job done. The only characters who perhaps don't succeed at this are the ones who get killed off too soon. On repeat viewing, some scenes really do seem to be pasted on after the fact though. Clara's TARDIS interior scene seems to be punching up a season-long issue for her, and it's a bit bizarre that she and the Doctor could have made their way back to the TARDIS without a challenge. Then, the scene that they came from previously continues on from where it left off, and there is a sense that those OTHER scenes might have had more coherence without being interrupted by the navel examination in the TARDIS. There's also an awkward escalation of danger as the Doctor decides he's got to go into the Faraday cage with the ghosts to see them clearly enough to make out what they're saying. This is awkward because the camera conveniently neglects to show us how he ever got back out of the Faraday cage without letting the ghosts out as well - you'd think there should be an action scene there dealing with the problem. I'd bet this escalation was a late addition too, as the plot would remain far more logical if he'd just stayed outside the whole time. The mystery builds up quite nicely as this first episode comes to its climax, and it successfully projects a whole new arena to expand into for its next episode, before giving us one of the most boggling cliffhangers ever. This was a very good episode for this story, but also for the Doctor Who program as a whole. It managed to send a signal to us long-time viewers, to say that two-parters might just be the norm for this entire season, and indefinitely into the future.... I was definitely liking that idea. Part two: "Before the Flood" succeeds quite well for a time while exploring some of the details of its new setting, but ultimately this episode collapses down a fair bit in terms of quality and interest levels. The answers to the main mystery, even though remaining fairly solid and logical, turn out to be a bit underwhelming and undercooked. A brief rendition of Beethoven's 5th leads into a version of the title music with an electric guitar bassline added. Is this Peter Capaldi himself performing this instrument here? At any rate, this is the season's only significant attempt to update what I still consider to be the worst official title sequence in the show's 50 year history, and it doesn't really improve it. The graphics, though not inspiring, would be passable, if only the music could be fixed. What's really needed is to replace the instrument(s) carrying the main melody line - get rid of the buzzy tremolo and pitch wavering and ineffective "witchiness". Instead here, the plastering over of the bassline with another harsh buzzy sound has simply made the music noisier. Not good. It would be about now though, as we got significant scenes set in the TARDIS, that I first really noticed how Michael Pickwoad had added to the TARDIS interior walls more "round things", or roundels as they were known on the classic show. Good move; I like that a lot. Kudos. I'm so glad Pickwoad came aboard; he's been steadily improving this show ever since. Peter Capaldi very entertainingly and successfully "breaks the fourth wall" to tell us audience members directly what the "Bootstrap Paradox" is. I'd guess this is meant to be one of those "oh-so-clever" intellectual puzzles that keeps us thinking long after we've finished viewing this two-part piece of art. Well, yawn...! This diverting idea only continues to appear to be a paradox if you leave one whole category of dimensions out of your concept of the space/time/choice continuum. Sadly that seems to have become the norm on Doctor Who, flaunted with a lot of fanfare on New Millennium Who whereas the classic series had tastefully avoided it. We've seen this idea, and dealt with it in our reviews, in many a previous episode. I think "The Shakespeare Code" (story no. 184) was really the first example to flirt with the concept indirectly, while "Time Crash" (where David Tennant's Doctor meets Peter Davison's) was a more full-fledged, on-the-nose example, written by the Moff himself. As I'm not particularly interested in repeating myself, I'll just say that the key to this paradox is in imagining the sequence of events not in a circular loop, but in a spiral. Yes, we've added a dimension. We can expect variations and different choices to show up each time through the loop. Trace the sequence of events back far enough, and things will be different enough, that you'll see clearly who composed what. The echo has a beginning. So, anyway... with the Bootstrap Paradox not holding up as being all that clever or freaky or powerful, the characters end up looking a bit silly when spending so much time emoting and swooning over that and all their other pointless hang-ups about time. Far too much of episode two's energy is misspent on time, and also on some less developed, more mundane examples of fearfully hiding from the monsters. The Doctor still has to pull a few clever rabbits out of his hat, which do satisfy on some levels. The TARDIS gets a few good moves in, and we get a repeat of a situation we saw previously in "Father's Day" (story no. 167), with the action being handled tastefully but the dialogue still paying much too much homage to the disasters of that previous story. The design of the final big bad creature is decent and okay, but not set to win any awards for horror, sci-fi, or drama. Capaldi's final confrontation with the creature works, but isn't great. It can't hold up to the midpoint confrontation David Tennant and Anthony Head had in "School Reunion" (story no. 174), partly because the animatronic creature can't hope to match Head's acting calibre, but also because the stakes aren't anywhere near as significant as these two participants try to make them out to be. Interestingly, we get the same actor doing the voice of this creature as did Darth Maul on Star Wars: The Phantom Menace - Peter Serafinowicz. Cool. That final confrontation is also being intercut with some action in the future underwater base that is both completely superfluous to the plot and much less exciting and interesting than anything the first episode delivered. In fact, seeing ghosts dragging axes around for the second episode in a row kind of reinforces in me how much uninventive horror scenes don't really do anything for me, and makes me wish for more enlightened subject matter on this show. Ho hum. Shall we discuss the "sonic sunglasses" at this point? I understand there's been a big fuss about these in fandom. I've really just been shrugging them off without thinking about them too much. Perhaps, wherever there have been strong objections, they may have at their heart the idea that the glasses are a permanent replacement for the beloved sonic screwdriver, an impression which doesn't really seem to come from the pure narrative of the season's stories themselves. Though I wasn't all that impressed by them, I didn't feel like I had to be. Couldn't they be just yet one more gadget in the Doctor's vast arsenal, in addition to the sonic screwdriver, K9, the psychic paper, the first Doctor's crystal ring [...ah yes], etc. Perhaps calling them "sonic" wasn't quite the right idea, and perhaps having a "sonic" anything performing every kind of magic imaginable was never the right way to go in the first place. Personally, I tend to think that the vast TARDIS interior is chock full of goodies that logically should be put to use in the adventures more often. Perhaps the best way to go is to show the sunglasses and traditional sonic screwdriver both being used in the same adventure - and define and limit those things that each of them are good at. Although, even at the end of the day, I'm still wondering about the feasibility of either the glasses or anything else to project holograms into the Faraday cage. At any rate, this story seems to give the sunglasses their best outing of the season, emphasizing the visual things that they might be better at. Nice. The final coda scenes work well enough though, and the story finishes up in fairly satisfying fashion. In the end, I'm glad this one was a two-parter, because much of its power did derive from things that required this extra length. And perhaps the most exciting thing I got out of this was the ability to look forward to more two-parters written by varying members of the team. Bring it on! 11 stories in 14 episodes U.S.
March 7, 2016. Blu-ray U.S.
April 5, 2016. Blu-ray U.K. This story is also available in a 6-episode volume with only some of the special features. Nov. 2, 2015. Blu-ray U.S.
Nov. 3, 2015. Blu-ray U.K.
Read the In-depth Analysis Review for the next story: "The Girl Who Died"